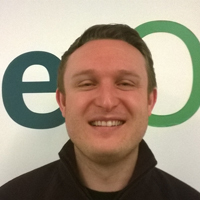 By Alex Robinson (Sage One Product Executive). For a while now our customers have been asking us to make some changes to Sage One to allow them to be more self-sufficient where Account Management is concerned. Whilst it’s great that our customers can call or email us 24/7 for help with Sage One there are some things they just want to do themselves. So with that, I’m pleased to announce that we’ve introduced the first in a series of improvements designed to allow our customers to self-serve. The new ‘Manage Your Data‘ feature allows our customers to reset their data so that they can start completely afresh with their Sage One accounts or payroll service, whether it be to start using Sage One for real at the end of their free 30 day trial or just that they’ve entered some transactions that were incorrect. (Note: This is something that customers can do in all our services – Sage One Cashbook, Sage One Accounts, Sage One Accounts Extra and Sage One Payroll). To reset your data, go to Settings > Service Settings where you’ll see the ‘Manage Your Data’ button (see screenshot below). 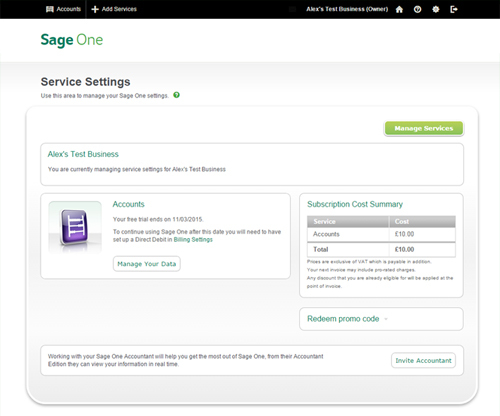 For detailed guidance on what to do next, read our ‘Restart your Sage One service’ help article. Of course, we realise that this is quite a significant action to take so as a safeguard we’ve also provided a means to restore to just prior to the last reset allowing the new one to be undone (see screenshot below). 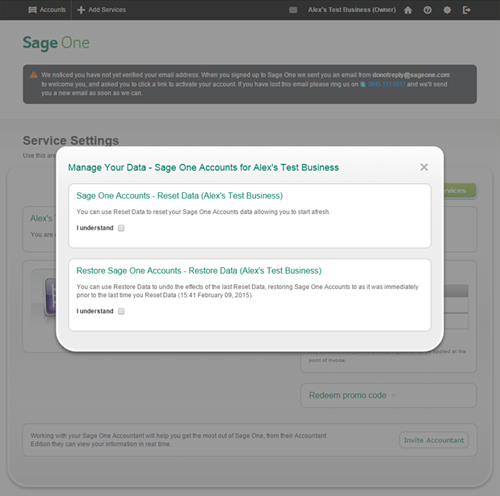 We’ll be introducing more features aimed at allowing our customers to effectively self-serve soon, so watch out for further blog posts on feature updates and bookmark our ‘Updates to Sage One Accounts Extra‘ page. You can also follow all our announcements on Twitter via the #SageOne hashtag. Wonderful story, reckoned we could combine a handful of unrelated data, nevertheless definitely worth taking a appear, whoa did 1 understand about Mid East has got more problerms also.